The long road to recovery from Hurricane Harvey will be challenging for Texas and those impacted by this devastating storm. GasBuddy would like to outline the tools we have available that could offer assistance as people work together on rescue operations and return to their homes. For those public service officers, emergency workers, volunteers and residents, please stay safe as you continue to deal with these unimaginable conditions. Our gas-availability tracking systems are active. This includes in-app features and a website to provide information notifying users of gas stations with no fuel or power. 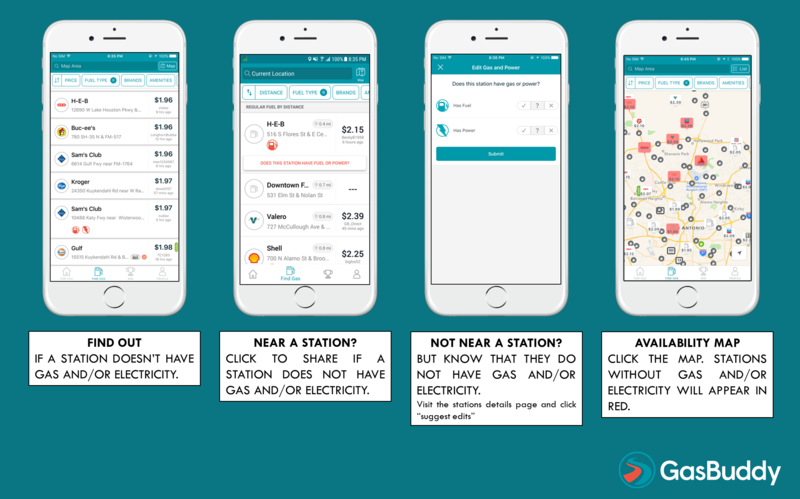 If you are near stations that have no gas or power (as determined by tracker.gasbuddy.com), the app will automatically display stations that have NO GAS or NO POWER when you select “Find Gas Near You” and the list or map screen appears. Visit http://tracker.gasbuddy.com to search for stations in your area that have reported no gas or no power. A quick reporting button —which only appears if you are very close to a station —will prompt “Does this station have gas or power?” Click on this button to report the gas and power situation at that station. At the bottom of the Station Detail page, you can “Suggest Station Edits” and report whether it has fuel or power. Please stay safe and our thoughts are with all those who have been affected by this terrible storm.